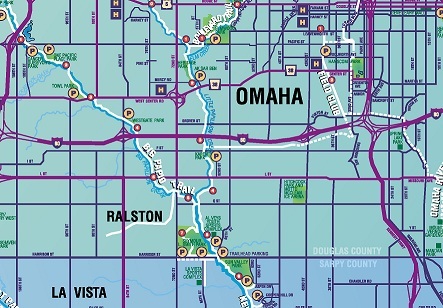 The Papio-Missouri River NRD is partnering with the cities of Omaha and La Vista to extend the West Papio Trail. The project will start at the Giles Road bridge just west of 108th Street, following a former railroad line over Hell Creek, under Harrison Street and Interstate 80, along Harry Andersen Ave, and connecting to the south side of Q Street. This photo shows the existing Hell Creek bridge constructed around 1905. Stabilization work was completed on the slab below the bridge, and a new deck will be constructed on top for the trail surface. Full designs for the trail will be complete in summer 2017, with construction planned for spring and summer of 2018. A public information meeting was held on March 14, 2017. Around 35 members of the community attended to learn more about the project, ask questions, and to show appreciate for past and future projects to improve the trail system throughout the metro area. They are called Paths of Discovery. They crisscross the Omaha and Council Bluffs metro area, spreading outward, safe, diverse, inviting, healthy and fun. 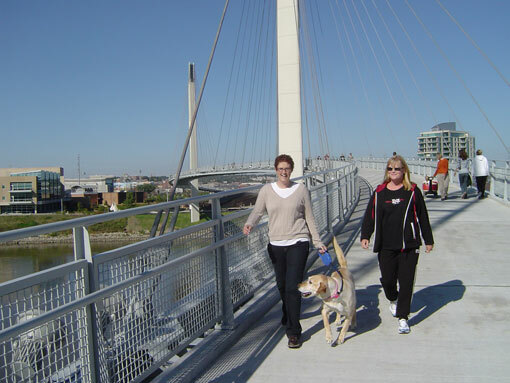 The birth of our outstanding Metro Area Trails System came in 1990 with the opening of the first three-mile section of the Keystone Trail in Omaha. Now 27-miles long, the Keystone serves as the backbone for an ever-expanding network. The nationally recognized success of our trails effort is due to a coordinated commitment among local agencies for planning and constructing trails. The trails network is available to a wide variety of user groups, including walkers, joggers, bicyclists, skaters and cross-country skiers. Further, the system is accessible to people with disabilities and anyone just wanting to experience nature. While the network seamlessly connects parks, sports complexes, swimming pools, and flood control reservoirs such as Zorinsky and Wehrspann Lakes, recreation is not its sole function. These trails are an excellent alternative to the use of automobiles and other, more traditional, methods of transportation. There is no fee, nor a fitness test for admission to the Metro Trails System. Every family – regardless of size, regardless of income, regardless of where they live – can make it part of their lives. It’s there every day for biking, hiking, skating, jogging, or just enjoying family time. There is a trail near everyone, whether in Omaha, Council Bluffs, Ralston, La Vista, Papillion, Bellevue or a growing number of smaller communities. Get going on your own Pathway of Discovery. 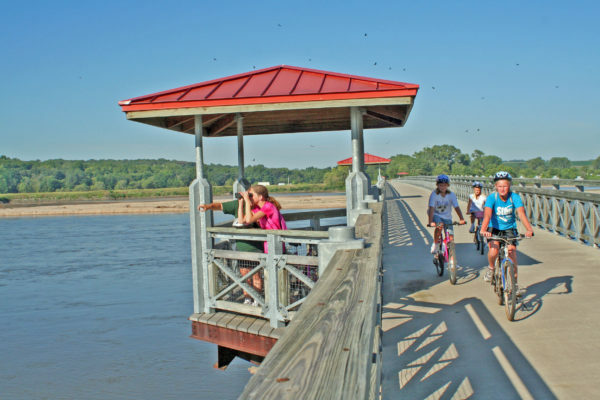 A spectacular connection now joins trails in Omaha and Council Bluffs and has quickly become a community icon. The Bob Kerry Pedestrian Bridge is a unique cable stay structure. The main span stretches over 1,000 feet at an elevation of 50 feet above the river. Tall pylons hold the steel support cables and a lighted bridge deck. Linking nearly 150 miles of trails on both sides of the river, the bridge not only serves as a transportation corridor, but will promote economic and community development. Most of the funding ($19 million) for this signature bridge came from federal transportation funds. Local partners include the Cities of Omaha and Council Bluffs, the States of Iowa and Nebraska, the Papio-Missouri River Natural Resources District and others. The $2.7 million Platte River Connection project, including the recently named Lied Platte River Bridge, opened on June 1, 2002. The Lied Foundation was a major contributor to this project. Work on the abandoned Rock Island Bridge, which stretched over the Platte near South Bend in eastern Nebraska, included many phases to make sure this bridge provides a safe and efficient trail for hikers and bikers. The top of the old bridge came off to be replaced by a 14-foot wide concrete trail with railings and scenic viewing platforms. On the Cass County side, parking lots are now available, as well as the short trail that will eventually connect to Lincoln’s MoPac East trail. On the Sarpy County side of the project, crews have completed a parking lot as well. A short trail has been built there, bringing the total mileage to 1½ miles between parking lots. This bridge and adjacent connector trails will be a first step in linking Omaha and Lincoln via a trail system to be completed within the next 5 to 10 years. The two short trails on each side of the bridge connect to Highway 31 on the north and Highway 66 on the south, providing a scenic view of the Platte River in a popular portion of the Platte River Corridor. Already this area hosts attractions such as Mahoney and Schram State Parks, Strategic Air Command Museum, Quarry Oaks Golf Course and the Henry Doorly Zoo Conservation Farm. Many groups and agencies have worked to make this bridge renovation possible. The Papio NRD teamed with the Lower Platte South NRD based in Lincoln, the Nebraska Trails Foundation, the Great Plains and the Eastern Nebraska Trails Networks, the Nebraska Game and Parks Commission and the NE Dept. of Roads. Funding for this project is provided by many of these agencies as well as from federal transportation funds available through the US Department of Transportation. The Kiewit Foundation also contributed greatly to this project. Eric Williams 444-6222 or ewilliams@papionrd.org.